LAS VEGAS -- Badou Jack was already well behind on the scorecards when a headbutt sliced his head approximately four inches down his face. Referee Tony Weeks gave Jack a chance to quit, but he chose to fight on. 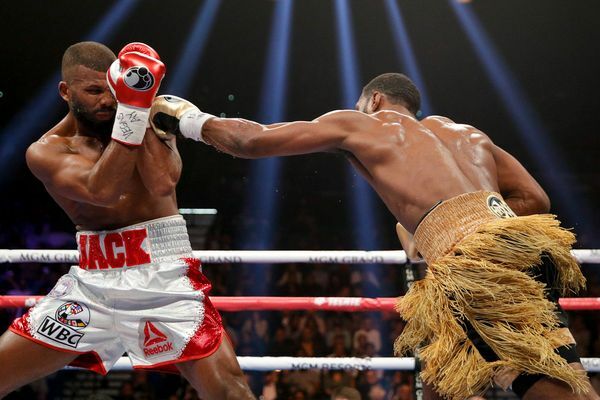 Marcus Browne won a one-sided unanimous decision and a vacant interim light heavyweight world title in the co-main event of the Manny Pacquiao-Adrien Broner card Saturday night at the MGM Grand Garden Arena in Las Vegas. Browne won on scores of 119-108, 117-110, and 116-111. FightNights.com scored the fight 119-108 for Browne. "He was a real tough competitor. He thought he would take me deep in the rounds and drown me, but I came in shape," Browne said. "I used my athletic ability. I did what I do best -- box the crap out of people. I was too slick, too sharp." Browne (23-0, 16 KOs), 28, of Staten Island, New York, a southpaw, did not get off to a quick start, but Jack did virtually nothing for the first three rounds. Jack (22-2-3, 13 KOs), of Las Vegas, who had won world titles at super middleweight and light heavyweight and had faced numerous top opponents, in a peculiar change of strategy, charged at Browne and clinched. But Browne was able to evade and counter Jack effectively. In the seventh round, an accidental headbutt opened a sickening gash down the middle of Jack's forehead. The 35-year-old struggled to see through the blood streaming down his face for the rest of the fight. "He was coming in with his head all night," Browne said. "I was telling Tony all night, 'Watch his head.'" Browne hurt Jack in the eighth round with a plethora of body punches and hooks to the head as Jack's face continued to leak. In the 11th round, referee Tony Weeks called time to have the ringside doctor examine the cut. Jack was allowed to continue. In the 11th round, as blood poured down Jack's face, he pounded his gloves together for Brown to come and get him, but Weeks called timeout to have the cut examined by the ringside doctor. Jack was allowed to continue, but blood covered his face and body, Browne's body and Weeks' shirt. Jack was immediately transported to the hospital after the fight.